The tide flows in and out, the sun rises in the east and sets in the west, and discontented Labour MPs keep promising they're going to split off and launch a new party "soon". According to Toby Helm, one of The Observer's's biggest cheerleaders for this miserable Blairist project, discontent over Brexit and Jeremy Corbyn's foreign policy positioning are bringing them close to quitting. But hold on a moment, thanks to the benefit of having a memory aren't these always the reasons? So why now, what's new, how have things changed? Continuing the fine tradition of the diminishing number of MPs said to be champing at the bit for a new party, Toby's exclusive puts the latest tally at six, which is down six on the proto-party talks alleged to have taken place last summer, and the 30-40, and 80-100 before then. Who are our dramatis personae on this occasion? There's Angela Smith, the MP who has curiously chosen the private ownership of water has her hill to die on. We have our mate Chris Leslie, or as I prefer him, vacuity in a suit. And, on this occasion, Luciana Berger's name is roped in. Hers has proven a career noteworthy in two respects - she's more famous for quitting the shadow role for mental health than anything she did with it, and her murky selection in 2010 thanks to knowing the right people over and above any discernible talent. Who could be the "three others" on the verge of quitting? Mike Gapes has recently been straining to get in the news, so one shouldn't rule him out. With gravitas like this on their side, how could they not succeed? Well, they are going to fail and hard if they ever have the guts to follow through their tiresome threats. When these stories started circulating in the summer after the last general election, the conditions against a new party then still apply. There is zero name recognition for the people involved except perhaps, ho ho, Tony Blair. Apart from money, they have no leader, no activists, no profile with the wider public, and not even a pool of voters - despite their best efforts at trying to win one. Though, to be honest, whatever this gaggle of has beens and never weres decide to do they're doomed anyway. There's more of a chance of Donald Trump showing some humility than any of these getting adopted again by their constituency party as Labour candidates. Why go through this tedious, rinse-and-repeat ritual of announcing their intentions? Just as matters have come to a head for Theresa May, so Brexit is forcing the petty scheming of the Blairists to a conclusion. This last week has shown there is no way to get their beloved (and undesirable) second referendum through the Commons. For all their disingenuous arguments like "how can more democracy be undemocratic?" (an point, we'll note, they never accept when it applies to the left's efforts at democratising the Labour Party), and the huge amount of money spent and unrivalled media access, they've succeeded in persuading absolutely none of their colleagues that a rerun is a good 'un. They've finally hit the brick wall of reality, and they think a new party - or at least the talk of one - will help scrape them off. The other consideration is the infighting within continuity remain itself. From before the referendum until now it's been a top down, elite affair with the interests of British capital front and centre. Only someone who is a member of these exalted circles and moves exclusively within them could think putting forward Alastair Campbell as one of its main spox is a good idea. However, as Buzzfeed reported last month the campaign is falling prey to the centrifugal pressures rending at it. One faction want it to continue as an umbrella organisation determined to avoid Brexit, and they're at odds with the others for whom anti-Corbynism is the chief consideration. 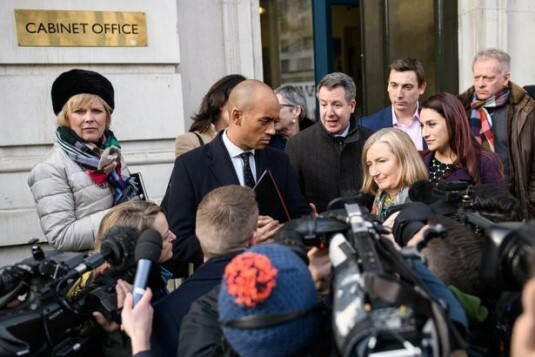 And in turn both are variously ill-disposed to the prima donna moving and shaking by Chuka Umunna who has long harboured his own vanity project. In other words, without really doing anything they've knackered themselves out. What's left for them to do? Continuity remain was a hiding to nothing, and there is zero chance of them making a comeback in Labour. They had the opportunity to re-examine their politics and think about what they mean in the context of Labour offering a genuinely transformative programme, but for them to put the party first was asking too much. Besides, that's something to be expected of the little people but not mighty Westminster titans like themselves. They've mouthed off so many times without putting on the trousers, and because they have zero name recognition and no experience of organising bar ordering what to have for lunch, any new party would be a miserable, half-hearted and dismal effort. A fitting finis to their careers, don't you think? It already exists - it's the Lib Dems. More likely after Labour lose next election, Corbyn will be replaced by a less controversial figure on left who will unite party with a more centrist approach and could even win the next election. Rather a lot of cliches and soundbites: "They've mouthed off so many times without putting on the trousers" etc. No mention at all of the dismay by Momentum, the mass membership and many others that back Labour that Corbyn is being poorly advised by those he took to meet May to discuss Brexit. Wot, no Starmer, his Brexit Secretary? To these MPs- goodbye- we don't have the time or energy for this in our party. Well paid and selfish. Lets get on with building real capacity on the ground, to win the next election, to build our country, to give 'ordinary' people a better life. - wholeheartedly support the manifesto (although some would, I suppose, see this as more of an encumbrance). Nice concern trolling there, "Unknown". But do even you actually really believe it? Nothing is more stupid than a new centrist party. Why bother, despite the hyperbole about Labour shifting to the far left Labour still has a place for the Social Democrat in England at least, In Scotland politics has lost contact with the electorate, all parties without a core belief just marking time. I am still surprised that commentators within Labour believe the party are going to have a working majority, a Corbyn minority government could happen quite soon but we live in reactionary times. Speedy; Why do you believe the centre has moved to the right? Why would a centrist approach win? Unknown; Where is the evidence for this dismay? Johny - the centre has been moving right since 1979. Before 1979 there was a broad consensus far to the left of today - the policies of Ted Heath would make the ambitions of today's Labour look as if they occupied a right-wing fantasyland. And that's my point - while the left fiddled during the 1980s, the political centre of gravity moved far to the right - by the time Labour got back in, not only did they argue that they had lost the argument (Thatcher said Blair was her greatest accomplishment) the UK of 1997 was unrecognisable from 79. Now the UK Labour will inherit post-Brown government will be even further to the right, and once again the left will have let the Tories get away with selling the austerity/ Brexit narrative. Yes, the "centrists" must be opposed and denounced. But to use that as a stick to attack "continuity remain" (ha ha ha) and to deliberately ignore the fact that there is a clear and overwhelming majority for remain -and it's overwhelmingly left wing and (until now at least) broadly pro-Corbyn) is a specious and unworthy stance. Yes the official pro-remain and people's vote campaigns are mostly liberal. Many of the young people who support remain are broadly small-l "liberal2 in their outlook. Pro-remain socialists want to stop Brexit for different, and better, reasons. But the fact that our politics have not transmitted into a militant, socialist Remain movement is not their fault, but ours. Let’s imagine how much bigger the anti-Brexit demonstrations could be — and how much further we could shift opinion, not just to remain but to the left — if the Labour Party leadership respected the majority view of its members and came out unambiguously against Brexit. At conference, the party’s leadership used the unions to stamp on the membership, and we came out with a fudge policy. All options on the table, and no guarantee of a referendum on the deal despite overwhelming support for it. As a result the Remain movement is still being led by the political establishment, by centrists and liberals. If this continues then it will not be able to advocate a programme capable of solving the problems at the root of the Brexit vote. As socialists, we need to provide the antidote to the scapegoating of migrants, and offer solutions to the housing crisis, poverty and a collapse in our public services. But a craven capitulation to backwardness and insularity and/or the fantastic nonsense of a supposed "left" Brexit will get us nowhere and will fail to answer the big issues that led to the Leave vote in the first place. Yes, things have moved to the right in the 1970s in some respects. But firstly, the key word there is "some". Secondly, there is now some evidence that much of that right wing consensus is being challenged as the failings of four decades of neoliberalism become ever more evident. One argument against that, I agree, is the upsurge of nationalist and at times actually racist sentiments in recent years. But then again, in the 1970s you actually got the National Front doing sizeable marches with huge banners reading "SEND THEM BACK". And such feelings remained under the surface, even at the height of 90s Blairite "end of history" triumphalism. So, as is sometimes the case, things aren't as simple as you make out. Speedy; Yes there was a rightward movement of the centre from 1979 till about 2005. But since then? The consensus, Speedy, is that things were moving to the right, until Corbyn came along and offered an non-triangulated, full-blooded social democratic manifesto. Everything is still to play for. It is easy to forget how far we have come and how fast. We were staring down the barrel of further privatisations until 2015, and the idea of renationalising anything was never seriously considered by anyone likely to lead a party. Now talk is of how best to renationalise, not whether to. Neoliberalism reached it's high water mark nearly half a decade ago. Except, Pleb James, it seems unlikely JC's Labour will be elected, so whatever its view may or may not be, in the world where things are actually happening rather than being talked about, austerity and post-Brexit neo-liberalism will continue. The "consensus" can think what it wants, but "reality" begs to differ. JC may share the initials of the son of God but he is not the second coming. The wrong Miliband? It rather seems you're guilty of living in the past yourself. David Miliband was directly involved in the illegal use of torture and, like Jack Straw, should currently be serving a long prison sentence. Miliband, like Straw, fought tooth and nail to stop any investigation into their ministerial activities wrt torture. The truth was it was a trick question, and both Milibands were wrong for different reasons. The electoral evidence suggests that public sentiment has been moving leftwards (again) since the mid-nineties. Blair's landslide was evidence of that since he was still to the left of the Torys and even those who voted for Tory-lite still wanted their Toryism lite or else they would have voted tory. As the New Labour became more rightt wing its electoral support steadily declined and as the Lib-Dems became more left wing theirs increased until their high point where they, peversly, went into coalition with the conservatives, swiftly followed by a crash in their support. That sentiment has now attached itself to Jeremy Corbyn, but whatever happens it can only grow because of the effect of neo-liberalism's continued failure. Ah, I missed that classic from Speedy. David Miliband was, and is, a political android with zero empathy or actual political skiils who lost a completely "unloseable" leadership election, and meanwhile left his own constituency party to rot - a scandal which deserves more attention than it has recieved. Only the worst kind of #FBPEist "centrist" zombie continues to think, against all the evidence, that he is some sort of saviour.